Trump Discussed Political Correctness With the Right’s Favorite CelebritiesThe president hasn’t looked this happy in months. 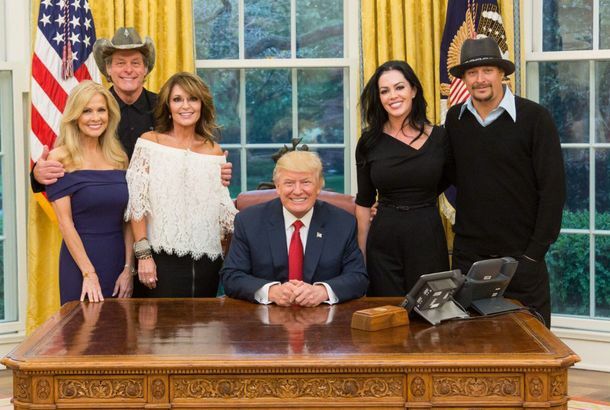 So Sarah Palin, Kid Rock, and Ted Nugent Walk Into the White HouseHere’s the latest Oval Office photo to quietly take in. Nugent Apologizes for Saying ‘Subhuman Mongrel’He’s sorry to the Republicans he embarrassed. Rand Paul Blasts Ted Nugent for Calling the President a ‘Subhuman Mongrel’Among Republicans, this counts as a bold stand. Ted Nugent’s Wife Pretty Polite About Her Airport Gun ArrestConsidering her husband threatened to shoot the president. Ted Nugent’s Brother Is UnexpectedAlso, he was the CEO of Revlon. Ted Nugent Attending State of the UnionSo inspirational. Military Nixes Ted Nugent Concert Over Obama RemarksMakes sense. Ted Nugent Cleared by Secret ServiceThe end. Frank Rich on the National Circus: Hookers, Guns, and Stay-at-Home MomsThe general election begins with one crazy week. Ted Nugent Has High Hopes for His Secret Service Visit TomorrowHe’s “looking forward” to it. Mitt Romney Will Take Pretty Much Any Endorsement He Can GetTed Nugent, for example. Ted Mann (Secret Son of Ted Nugent!) Plans Deli and Beer Garden in Brooklyn“I got to his ranch and he was grilling elk he had shot for me,” says the restaurateur of meeting his father. Kate Hudson Eats for Two at Indochine; Kevin Spacey Parties at Oak Room and MPDPlus: Adrian Grenier grabs some guac at Dos Caminos, Ted Nugent inadvertently rocks Old Homestead, and more, in our weekly roundup of celebrity dining. 10 Cheesiest Cheeseball GuitaristsSteve Vai and Jeff Beck both have new albums. Can you guess who’s even cheesier? Ellen Page, Cillian Murphy, and Marion Cotillard to Help Christopher Nolan Delay Batman 3Plus, who wants to get shot by Ted Nugent? Ted Nugent Explains His Personal Philosophy, Drives Down Property Values Near His HousePlus: Of Montreal’s Kevin Barnes on the people living inside him. ‘Crossfire’ With Ted NugentProgressive musician Ted Nugent took time out of a recent concert to talk politics with an equally forward-thinking audience.